Cobble Beach Wedding Photography is made beautiful by it's location on the shores of Georgian Bay near Owen Sound, Ontario on Lake Huron. Steve & Lisa McLeese's wedding was a summer ceremony to remember. 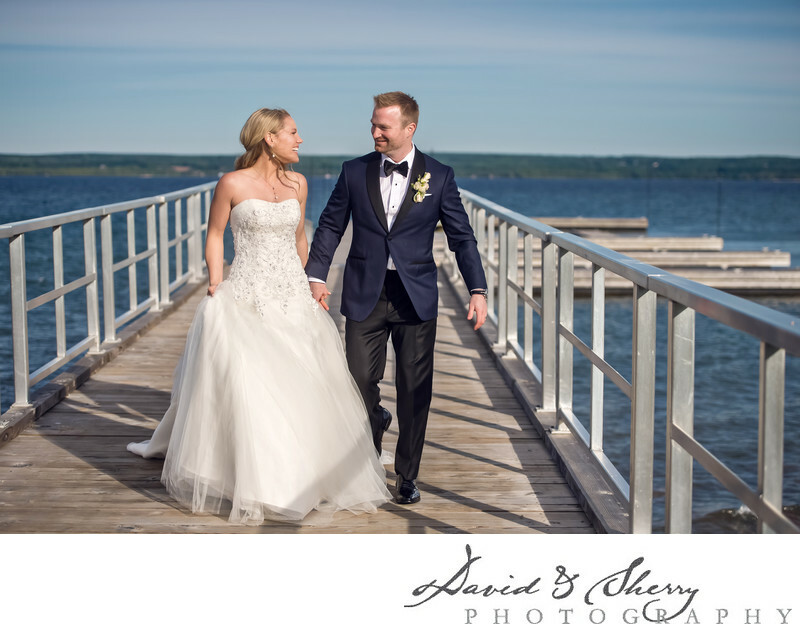 This photo of them on the dock is a show of the style and elegance of their luxury wedding on Georgian Bay. Her veil is picked up and is blowing in the wind while she is by the side of her new husband. There is a Muskoka feel to this wedding and while the wedding didn't take place in Muskoka, Cobble Beach is the best weddng venue on Georgian Bay. They always do a fantastic job of hosting with amazing food provided by the Sweetwater Restaurant and the all in one amenities of having hotel rooms and cottages on site it's world class golf course resort. The dock is anchored over the bay by the signature lighthouse and 17th green and on a sunny day the view you see in this photo is the feel you get all over the resort. The groom was dressed in a custom bespoke suit while his bride was in a gorgeous gown which showed off her figure beautifully. This beautiful bride and groom portrait was made possible by the beautiful bride and groom, gorgeous Ontario lakes view and wonderful weather that was present on their wedding day. I always enjoy making my way to the lighthouse and the dock for photos of the bridal party and the couple. The best place to get married on Georgian Bay or near Owen Sound is Cobble Beach. The dock provides such beautiful options of views of the lighthouse, the bay and the blue waters of Georgian Bay. We love being Cobble Beach wedding photographers so we can explore all of these spaces. Once we are completed the wedding portraits we head back to the brand new wedding pavilion at Cobble Beach. Located to the south of the wedding green this brand new space is perfect for weddings and events. Full windows surrounding the building with a full kitchen able to serve 220 guests.